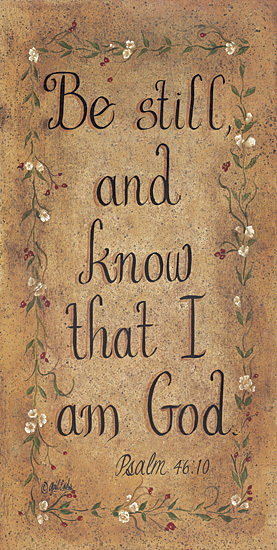 Be still and know…. – Journey to my heart…. It was the very prevalent news story of the Casey Anthony verdict…I do not know if she is guilty or not, but there is so much tragedy in this entire story…I just can’t make sense of it! The missing four-month old in the Ludington area just isn’t feeling very hopeful…I just can’t make sense of it! I met with a woman today who was in a car/deer accident and is now living with a shattered hip, pelvis, two broken legs and much despair. I met her for a short time and yet I could see a very tough exterior with a very vulnerable heart.I heard her holler and scream and demand much. I am a strong believer that even difficult people deserve good care. I see her struggle and I see how she treats people. But where do we go from here? I just can’t make sense of it! Is it different today than any other day? Likely not! There are shocking national events every day, there are local tragedies every day. Every day there are difficult people needing to learn to rely on others for assistance and the number of people in our circles of community dealing with life changing news is likely more than we care to count. And so, in my awareness of this today, I am reminded to seek God’s presence and remember that I am not called to make sense of these tragedies. As I take time to wonder and reflect, I find myself asking…. How do I live and stay present in the midst of the confusion that can feel like a fog around me? How do I show up as I move into these people’s lives, or conversations about these situations, in ways that offer hope? Am I able to quietly communicate my solid belief that I trust God deeply: trusting God with the outcomes on the good days, as well as the outcomes on the days when I mutter, I just can’t make sense of it? Yes, I will choose to hang onto that belief and embrace what I know to be true. Previous Previous post: A fun day….family, food and fetch!